B&O Beoplay E8 by Bang & Olufsen – An AirPods beater? 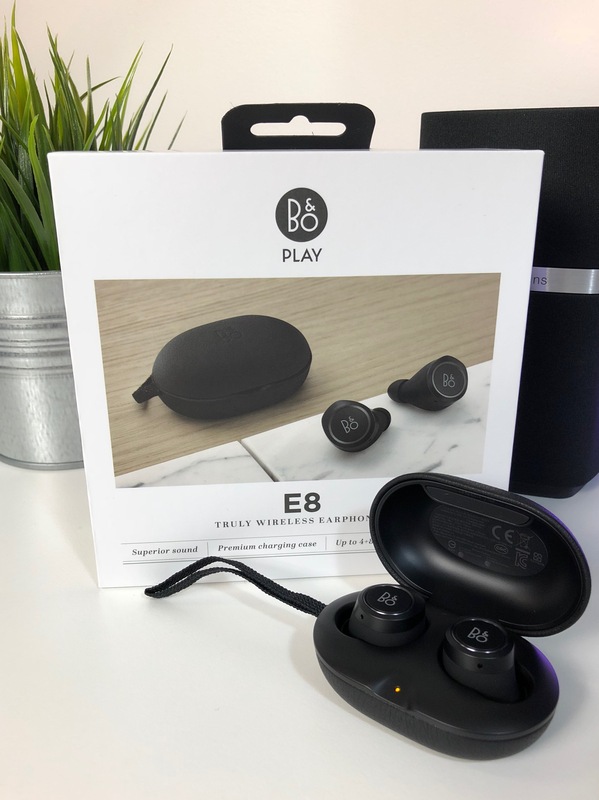 The Beoplay E8s ship in a very nice box, and as with most modern gadgets, the contents are very simply presented and easy to unpack. 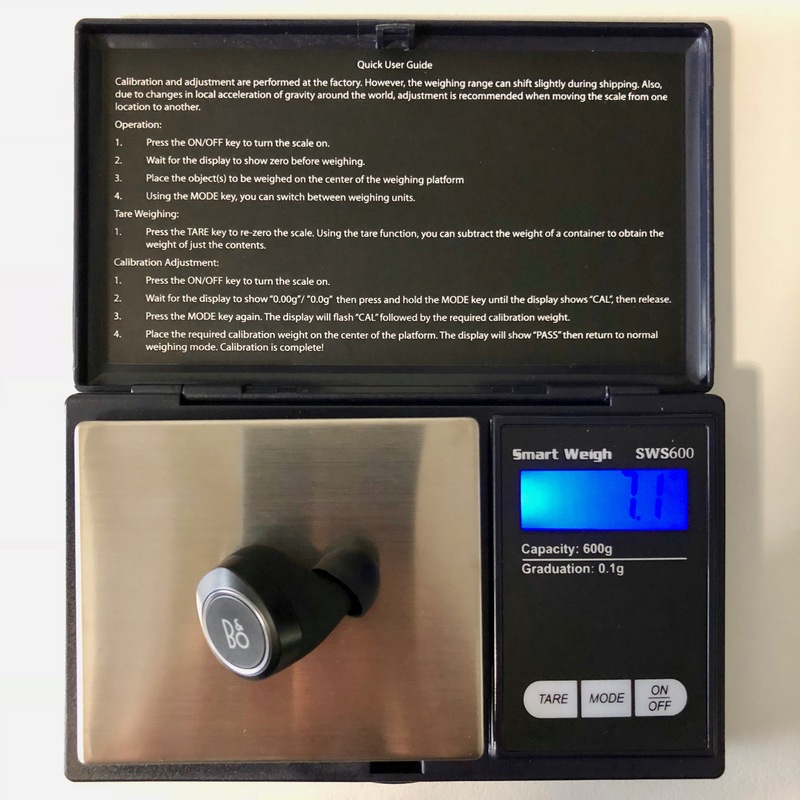 Inside we have the earbuds, a set of spare adjustable silicone earpieces, charging/carry case (leather), a USB-to-micro USB charging cable, and the instructions/warranty information. Although made from plastic, the E8s are very well designed and have a solid, premium feel. I have the black version, and find that they do pick-up finger-prints very easily, though. The charging/carry case is a nice addition, yet almost essential as the earbuds can easily be misplaced. The case will also allow the earbuds to be charged whilst on the move, and increase their battery life. B&O claim that the earbuds will last up to 4 hours on a single charge, and the case can recharge them a further two times, meaning you should get up to 12 hours of music playback; more than enough for a single days use for even the most avid of users. The carry case also has a fabric lanyard, making it easier to hold. At first glance, the Beoplay E8s appear to be fairly bulky. Each earpiece weighs 7.1g. 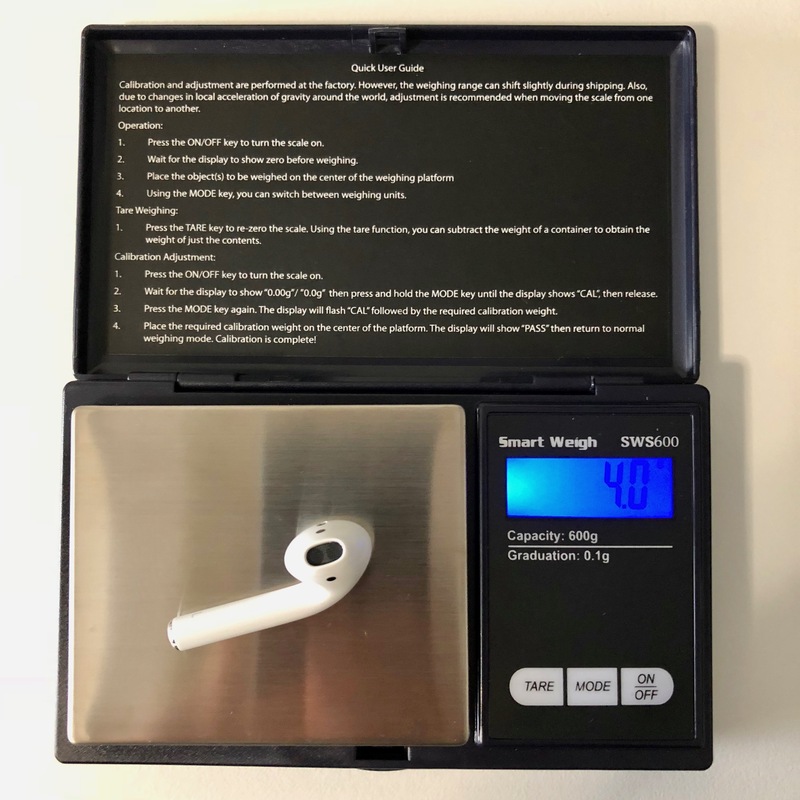 For reference and in comparison, the Apple EarPods weigh 4.0g (each), making the B&Os significantly heavier. However, they are comfortable in my ears, and I have not felt them slipping. As my own preference, I do not wear these types of headphones (wireless earbuds) for running, nor would I find them comfortable for general training; I much prefer something like the PowerBeats for exercise, but I digress. Using the E8s on the train and in my daily commute, I faced no issues with them feeling out of place, even on a crowded train. I would exercise caution with any wireless earbuds, though. Pairing the earbuds was a little troublesome with my iPhone 8, but we got there in the end. The entire process took around 5 minutes, but should only take less than a minute. To pair the earbuds, tap/press the right earbud to turn them on. Once on, press and hold on both the earbuds for 5 seconds and they will enter pairing mode. From there, select the device from your Bluetooth settings on your phone/tablet and they should pair. This is a one time process and when you subsequently take the earbuds out of the case and put them in your ears, they should connect to your device automatically. It took me a few attempts to initially connect them to my phone, but once connected, they functioned as expected. Simply remove the earbuds from the case, insert into your ears, and finally press the right earbud to connect to your device. A discreet audible chime will let you know that the connection was successful. There are a few observations I have made about the way the earbuds pair. The right earbud seems to serve as the ‘main’ connection to your device, and the left earbud then connects to the right earbud as well. The earbuds must be within close range of each other to play music. For example, if I take the earbuds out of my ears and move them away from each other, music will continue to play on the right earbud, but not the left. But if I move them closer together, music will play from both again. Another important point is that playback does not stop if I remove one earbud; this is something I don’t like, particularly if I am outside and briefly need to speak with someone. I will have to manually tap the right earbud to pause music before removing it from my ear, or I will lose my place in my audiobook. A unique aspect of the Beoplay E8s are the various swipe and tap gestures. These allow you to control basic music playback by pausing music, adjusting the volume, skipping between tracks and even activating your chosen voice assistant. In theory, this is a great idea! However, in practice, I found this doesn’t work too well. For example, a single tap on the right earbud is supposed to pause music, and a single tap again is required to resume. When I have tried to resume music, a single tap is not sufficient, and only a double-tap resumes playback. However, as can be seen from the tap gestures I have mentioned below, a double-tap is supposed to skip forward a track. In some cases, this does happen, and it is a little frustrating at times when these gestures don’t work as stated. On a positive note, the volume up and down presses work well. I am no audiophile, but really do appreciate good quality sound. I listen (mainly) to movie soundtracks/scores, as well as anything else that takes my liking. The sound from the Beoplay E8s is very impressive, and notably better than the Apple AirPods. My music is loud and punchy, there is no distortion at maximum volumes, and bass/treble are well balanced. The only thing I can be critical about is that the sound feels a little flat overall; definitely not a major concern and I am being a little pedantic to mention this. There is a slight amount of sound leakage, but not enough to draw unwanted attention (unless you’re in a very quiet room at maximum volume). Voice calls are also very clear, and the built-in mic allows for easy communication. I have tested the earbuds by phoning home a few times, and have not had any issues with not being heard, despite being outside with wind/noise. The B&O Beoplay E8s are a very well designed, high quality, and functional set of premium earbuds. The live up to the B&O name, and the sound quality is one of the best that I have had the pleasure of testing and using in a set of wireless earbuds. Their bulky appearance may be a little off-putting at first, but once in your ears, you will realise that these are a very comfortable set of headphones. Functionally, there are a few annoyances, particularly with the gestures, but this is not enough to put me off and I take these as a bonus, as my Apple AirPods lack these all together. Conclusively, I would highly recommend the E8s, despite their premium price-tag. « Leather Sleeve for 12‑inch MacBook – Worth it?